Do You Have Hidden Food Allergies or Food Sensitivities? There are few things that are more frustrating than working hard to improve your eating habits, consistently choosing fresh and natural foods, and still feeling unwell. Hidden food allergies and sensitivities are often a huge part of the problem. There is a lot of confusion surrounding food allergies and food sensitivities, and the differences between them. A food allergy is an immediate immune system reaction to a certain food. Food allergies are often mild and hard to detect, or can be severe or even life-threatening. For example, you may break out into a skin rash after eating something containing peanuts. Or develop bloating or nausea after eating eggs or wheat. Food allergies generally involve IgE antibodies, and are lifelong. Food sensitivities are different types of reactions, generally involving IgG or IgA antibodies. They usually cause milder symptoms, and are not life-threatening. Of course, this doesn’t mean that they don’t affect your quality of life or that they aren’t major factors in your health and wellbeing– really, what it means is that they’re harder to pinpoint. Symptoms are often delayed, and may not show up until several hours or even sometimes a day or two after eating the food in question. Like allergies, food sensitivities are reactions by the immune system to something that it perceives as a threat. When the immune system reacts to a threat, it creates inflammation. Inflammation can manifest itself in a number of different ways, leading to a wide range of symptoms including fatigue, headaches, digestive symptoms, joint pain, and skin issues. Inflammation is at the root of all kinds of chronic illnesses, from IBS to ADHD to Chronic Fatigue Syndrome, and this is often linked to undiscovered IgG food sensitivities. Identifying trigger foods and eliminating them can lead to improvement in many different chronic conditions, autoimmune disorders, and puzzling symptoms. There are many principles of healthy eating that do apply across the board, but the truth is that everyone reacts differently to different foods, and no book, course, or person in your life can tell you which foods are right or wrong for you without understanding and investigating this. Although there are some common triggers of inappropriate immune system reactions (including eggs, dairy, gluten, and certain nuts), there is also the possibility that you may be totally fine with eggs and nuts, and may instead have an inflammatory response to blueberries. So how do you get to the root of which foods affect YOU? Food allergy and sensitivity testing is really the best way to do it. A blood test is a simple way to detect what foods your body may be reacting to. It is possible to take on an elimination diet without testing, where you eliminate many common “problem” foods and then reintroduce them one at a time, monitoring your symptoms as you go along. But what if one of your trigger foods is something that is, for most people, very healthy– like blueberries? Food sensitivity testing eliminates the guesswork and SO much of the frustration, and allows you to take control of your diet in a personalized way. 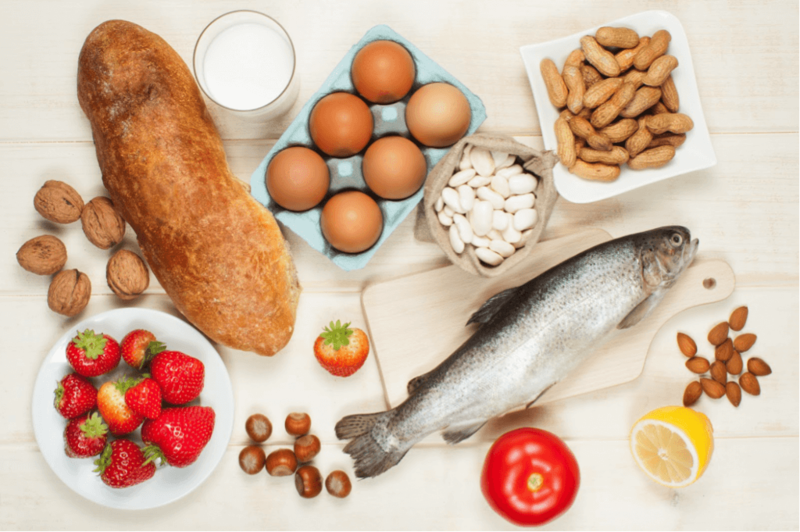 In my practice, I use comprehensive panels from a specialized lab called Alletess for food allergy testing, and to test for sensitivities to up to 184 different foods. Ready to get to the root of your symptoms, identify your trigger foods with food allergy and sensitivity testing, and take control of your health? Book an appointment with me online or call 778 478 0048.